Again, Trae Young... Any questions? This guy is already a star... WOW..
Washington Wizards president Ernie Grunfeld was fired Tuesday by team owner Ted Leonsis after the NBA club missed the playoffs for the second time in four seasons. The Wizards are 32-46 with four games remaining in the current campaign and ensured of their worst season since 2012-13. Tommy Sheppard, the Wizards senior vice president of basketball operations, will report to Leonsis in place of Grunfeld starting immediately as the team prepares to begin the search for a new basketball operations boss once the season ends next week. Lots of Wizard fans seem happy about his dismissal. oh my god....I can't believe Grunfeld FINALLY has been fired. Thank the basketball gods! 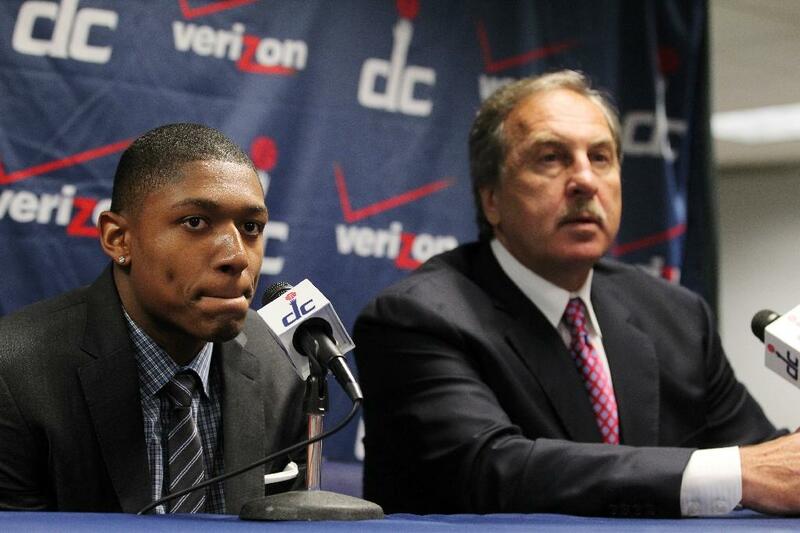 Hopefully they hire someone competent in his place and build a winner around Beal. Well, I mean... as Bomani Jones likes to point out, he's going to turn thirty-nine this year, and the Wizards have never had a fifty-win season in his lifetime. So yeah, I can imagine that Washington fans are probably tired of the... what do y'all like to call it? Treadmill? with 1:53 left in the game, Hawks coach takes out Trae Young in a 5 point deficit. If that's not the ultimate tank move, I don't know what is. despicable. Round 1 goes to Cousins, 10-8. Second round is a No Contest: Jokic and Cousins spent virtually no time head-to-head on the court together. But man, I tell you what, he gave FIBA World Champion Mason Plumlee the blues. In other news, Kevin Durant is pretty good at basketball. DMC winning the matchup against Joker? Hell yeah, brother! Don’t think I’ve mentioned lately how much I love my dude DMC. Demarcus has looked like the best guy on the court tonight and he's playing with 5 all-stars and against a guy vaunted as one of the best young players in the league. I mean, I'd feel better about giving him a big contract than I would about giving WC$ one. Lol Jerebko getting nailed in the face with a pass then begging for a foul call. Cousins always gets up to play top bigs. If Kerr can keep him engaged like that against lesser bigs, nobody's got a chance. Caron Butler said during the broadcast that he was talking cash **** to Jokic the entire game. Few things more entertaining in sports to me than the guy who talks trash, and then backs it up; FOH with that humility horse****! with 63 seconds into the game versus Denver, Pop gets ejected making it the fastest ejection in NBA history. This is now back to back ejections from Pop. Seems like he is ready to hang it up after this season. Lol @DMC. Trash talk between 2 players with ZERO playoff game combined must be fun for him. Nuggets played tonight like they took umbrage at getting punked last night. Jackson still getting minutes in Dallas, not doing a whole lot according to the box score, but they look like they are giving him a shot. The Stugotz is strong in you. Terrence Ross of the Magic is set to become the first player in NBA history to make 200 3-pointers and not start a single game.